October is traditionally a dry month in Southern California gardens. While water-wise plants are mostly dormant, some natives are still green and even producing a flower or two. 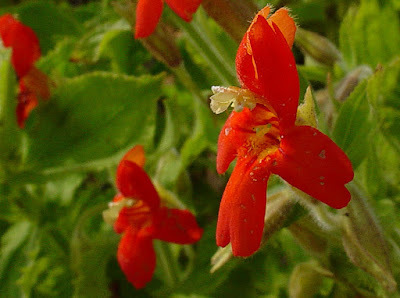 One such plant is the Scarlet monkeyflower, Mimulus cardinalis. We have one, with a few fall blooms, in Mother Nature’s Garden of Health. Scarlet monkeyflower is native to the Western United States from Southern Oregon to Baja California, Mexico and as far east as Nevada, Utah and western New Mexico. In California, it grows throughout the California Floristic Province (west of the Sierra Nevada Range), as well as in the desert mountains (Providence, White, Inyo and Panamint Mountains). Like the other moisture-loving monkeyflowers, Mimulus cardinalis grows in wet or moist places like stream banks, seeps and seasonal wetlands below 8000 ft. (2500 m.) elevation. Locally it still grows in the Santa Monica Mountains, on Santa Catalina Island and in the San Gabriel Mountains. It once also grew along the banks of the Los Angeles River and its tributaries. Scarlet monkeyflower, along with other native Mimulus and Diplacus species, was formerly located in the family Scrophulariaceae (the Figworts) and is still placed there by the USDA Plants database . Recent molecular genetic studies have radically changed our notions about this family. Many taxonomists now place Mimulus and Diplacus in the family Phrymaceae, the Lopseeds. Formerly a small, obscure family, the Phrymaceae are now considered to include over 200 species, mostly native to North America and Australia. Most favor moist conditions and several are widely cultivated as garden flowers. The genus Mimulus has also undergone recent taxonomic revision. As it currently stands, the herbaceous, moisture-loving California Monkeyflowers (annuals and perennials) are usually called Mimulus and the part-woody, drought-tolerant species are now placed in the genus Diplacus. Some taxonomists have argued that the N. American herbaceous species deserve their own genus, Erythranthe. Whatever the outcome, evolving names cause lots of confusion in the horticultural trade. The name Mimulus cardinalis is widely used in California, and we’ll use that name here – at least for the present. For more on the early botany of this species see reference 2. 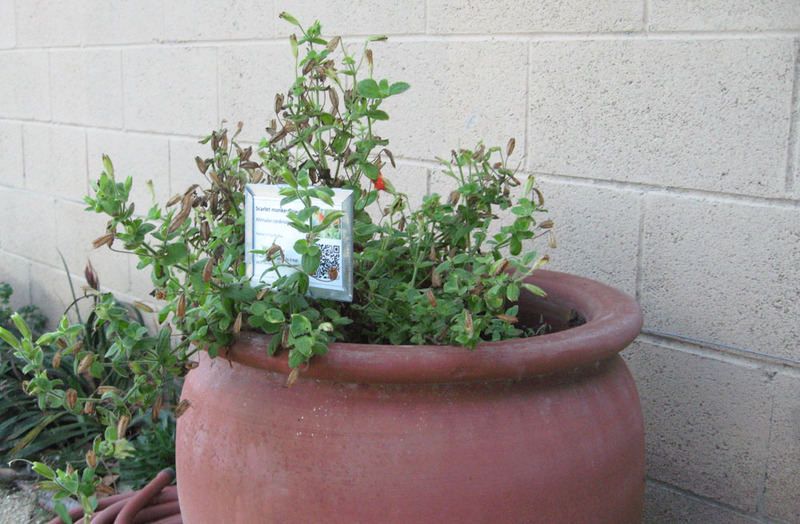 The USDA Plants database separates out plants growing in N. AZ and Colorado as Mimulus eastwoodiae, honoring Alice Eastwood . If you’d like to learn more about the amazing life of California botanist Alice Eastwood see: http://www.slideshare.net/cvadheim/alice-eastwood-2015 . Scarlet monkeyflower is an herbaceous perennial, standing 1-3 ft. (0.3 to 1 m.) to perhaps 4 ft. tall, with a spread of 2-4 ft. Plants may be erect (in sun) or more sprawling in shadier locations. A mature plant will have many stems. The leaves are opposite, roughly oval shaped, usually with strongly toothed margins and 3-5 prominent veins. 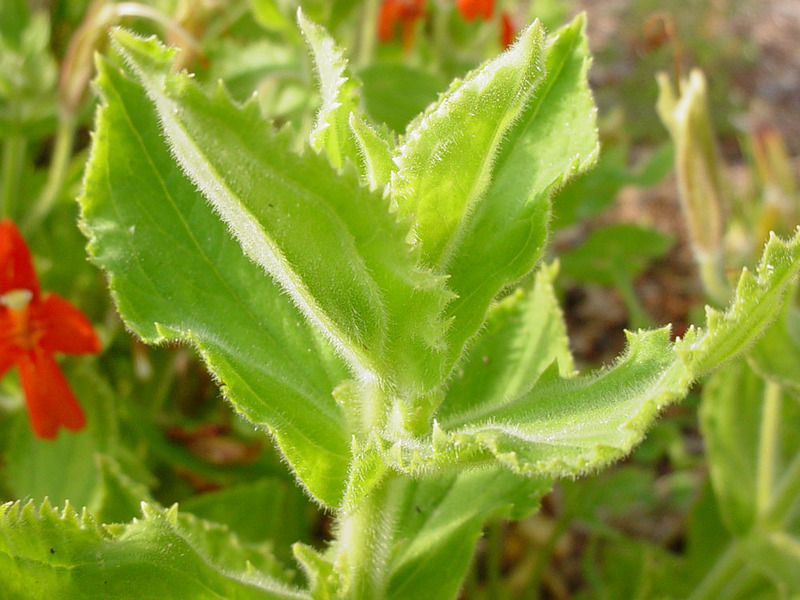 The foliage is yellow-green to medium green (occasionally darker), very hairy and sticky. If you look closely, you can see both the small, soft hairs and the secretory glands in the photo below. Scarlet monkeyflower (Mimulus cardinalis) - close-up of foliage. Note fine, soft hairs and small, round glands. 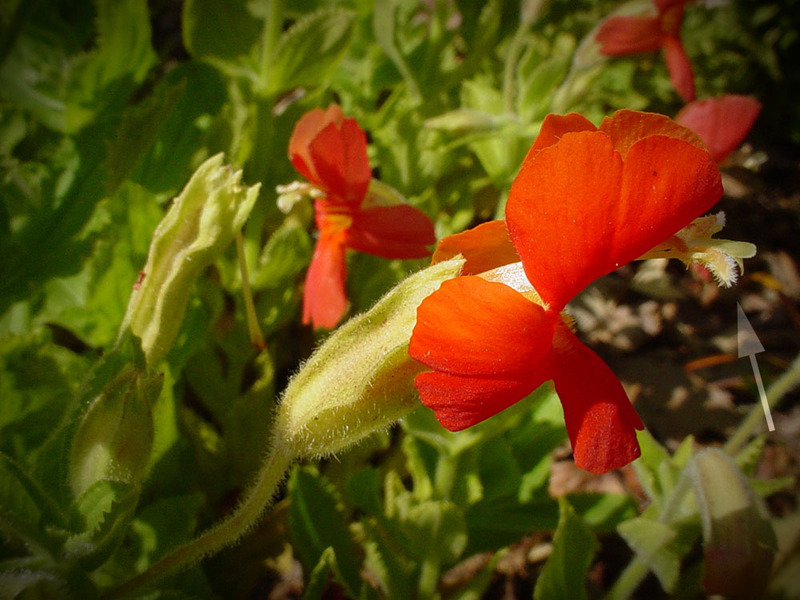 The flowers of Mimulus cardinalis are bilaterally symmetric, like a snapdragon. As seen in the photograph below, the petals are highly modified into five lobes. The upper two – which form the ‘upper lip’ – are bent forward. The lower three (the ‘lower lip’) – are bent backward. 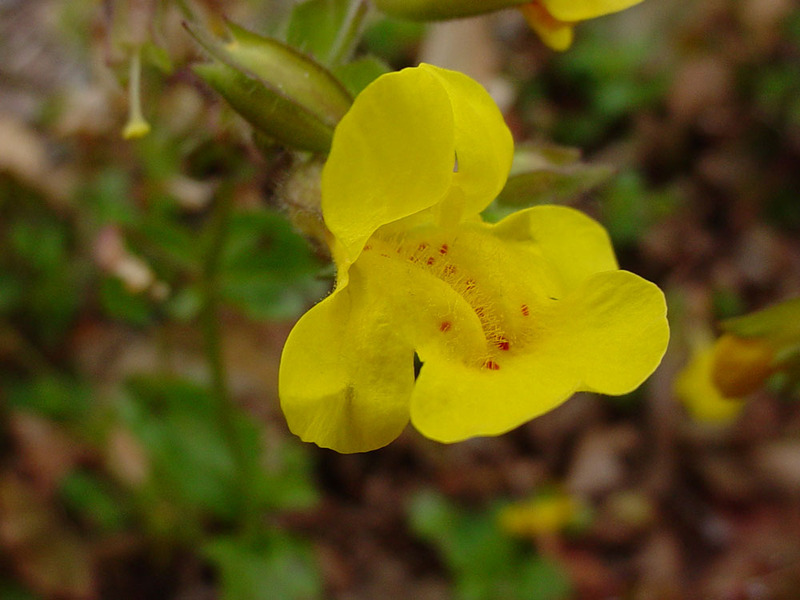 The flower is very narrow compared to other Mimulus, giving the impression that the entire flower has been squeezed from the sides (see photo of Mimulus guttatus, below, for comparison). When seen from the side (below) the unique characteristics of the flower become even more apparent. First, the flower has a rather long, tubular calyx (the green part – composed of the sepals), which will later become the seed capsule. The calyx covers a long floral tube. Second, the positions and shapes of the floral lobes are quite unusual. Third, the sexual organs are located near the upper lip, but extend beyond it (see arrow). The single pistil (female part) is green; the stamens (male parts that produce the pollen) are hairy in the photo. The location of the sexual organs, the long tubular shape and the flower color all relate to specialized pollinators – the hummingbirds. The floral architecture insures that hummingbirds brush against the sexual parts while retrieving nectar hidden deep in the floral tube. Pollination is a by-product of feeding, transferring pollen from anther to stigma. To learn more about the interesting relationships between native Mimulus and their pollinators, see reference 3. The flowers’ bright color, which ranges from scarlet to orange-red, is the most striking feature of Mimulus cardinalis. In our local plants, there is often also some yellow in the center of the tube. The foliage provides a strong color contrast with the flowers, making both green and red appear more intense. This is a good example of Mother Nature’s use of complimentary colors (those opposite on the color wheel) to ‘intensify’ colors, often to make the flowers or fruits more visible to pollinators or seed dispersers. Scarlet monkeyflower is classified as an obligate wetland plant in California. It’s not at all particular about the type of soil it grows in, but it does like its water. Clay soils can be an advantage in growing Mimulus cardinalis because they are easier to keep moist. The plants can even be grown in places with seasonal flooding – or in a pot in a pond (best to keep the crown just above the water level). Scarlet monkeyflower can be grown in full sun or – we think better – with some afternoon shade in warm L.A. Basin gardens. We grow our Mimulus cardinalis in a large fired-clay pot. It’s easier to give it the water it needs, in a garden that’s otherwise quite drought tolerant. We water our pot once or twice a week when it’s really hot and dry. This plant will spread via rhizomes in moist soil. It can form dense colonies and it also re-seeds on moist ground. So growing this plant in a container makes sense in terms of control as well as water needs. 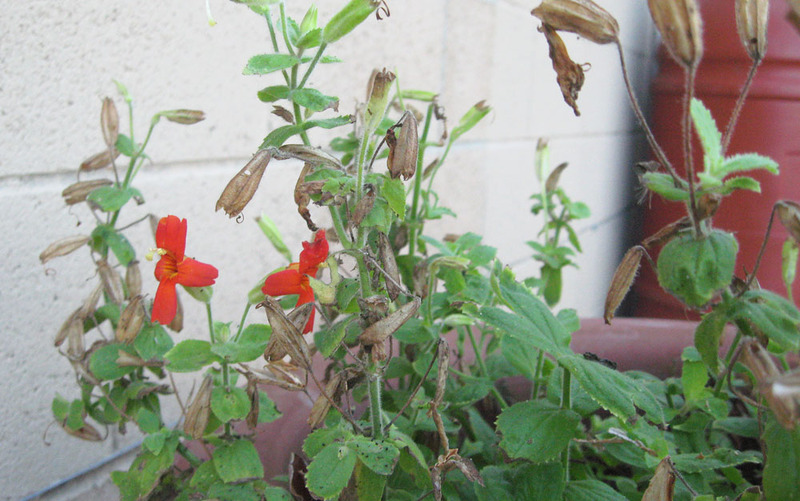 Other than watering, Scarlet monkeyflower needs little care. Cut the stems back by about 2/3 after flowering to keep the plant from getting rangy. If you cut back after the first blooming, plants will often produce a second set of flowers. Pull up the unwanted seedlings in winter or spring – they are distinctive with their light green color and fuzzy leaves. That’s about it. 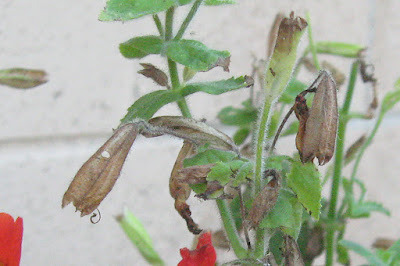 Scarlet monkeyflower seeds are tiny – like finely-ground pepper. You can shake them out of dry seed capsules. Or, if you want to collect them for growing, simply cut off stems with mature capsules, invert them in a glass jar or bowl, and let the seeds drop out. Mimulus cardinalis is a relatively short-lived perennial (3-5 years in most gardens), so you may want to grow some backup plants. They are easy to grow from seed, and summer/fall are good times to start them. Wet the potting soil, sprinkle seeds, water in well and keep the soil moist. We start our plants in small recycled pots, in an area with bright shade. You can place the pots in a tub with a little water to keep them moist. 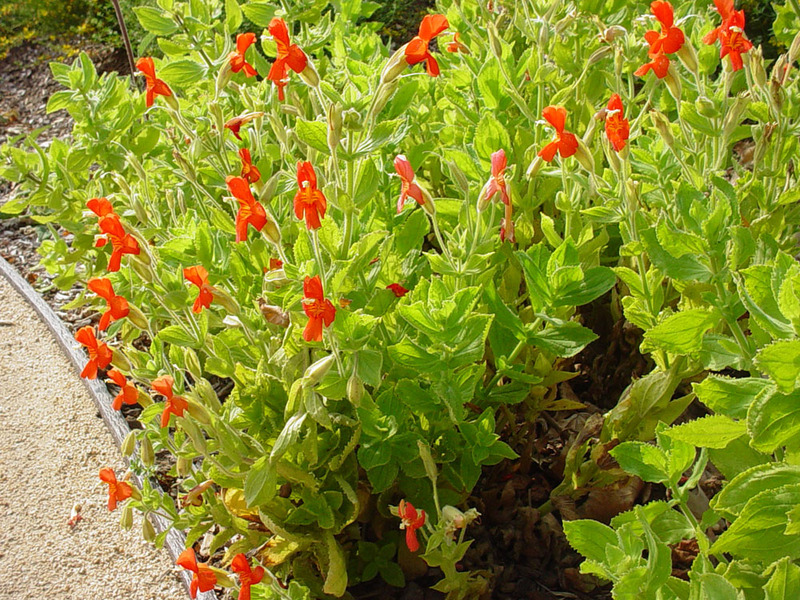 So, how to use Scarlet monkeyflower? It’s appropriate for any moist area of the garden – places with sprinkler overspray, fountain splash, around ponds/pools, watered swales/rain gardens and other green oases. These plants remind us of cool woodland streams. We love them in larger wetland pots (http://mother-natures-backyard.blogspot.com/2013/05/guilt-free-gardening-grow-wetland-in-pot.html) and alone in pots as accent plants. They add a wonderful touch to patios with bright shade or sun. 'Santa Cruz Island Gold’ is an attractive natural cultivar with golden yellow flowers. Of course, place them where you can see the hummingbirds. If you enjoy these special pollinators – and who doesn’t - plant Scarlet monkeyflower along with the Mints, Woodmints and other hummingbird plants for year-round pleasure. Mimulus cardinalis foliage is larval food for the Buckeye butterfly (Junonia coenia), another special garden visitor. Both the foliage and the flowers are edible. The foliage tends to be salty – try using the young foliage as cooked greens. You may enjoy their unique flavor. An infusion (water extraction) was used as a wash for babies in past times, and to ‘cool’ sunburns and minor skin irrigations. 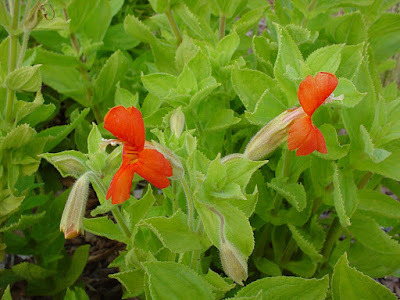 In summary, Mimulus cardinalis is an interesting wetland plant that adds a lovely green touch to local gardens. Plants are not only pretty, they attract hummingbirds and Buckeye butterflies. While not a major food or medicinal plant, this plants other fine qualities argue for its inclusion in more Southern California gardens. So snap one up at the fall plant sales (if you can find one)! I love the depth and quality of your posts. 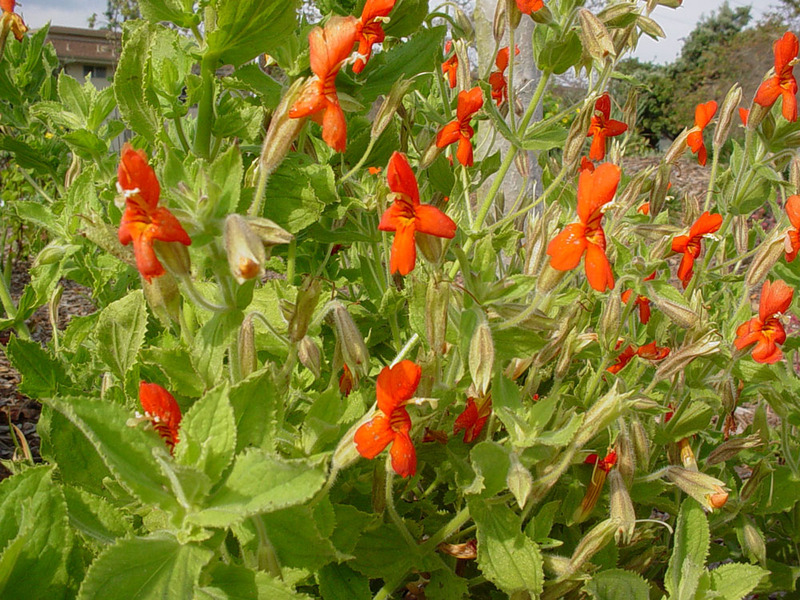 Mimulus has been a plant that many gardeners struggle with - mixing it into super-drought-tolerant situations - because of the water regime and the foliage issues. And the confusion with Diplacus hasn't helped. I hope in the future that this plant will finally take its rightful place.